I read Buzzfeed's 19 Signs You're Addicted to Thrift Shopping. One of the signs was having different ideas than most about what's still cool. Well, that's me. 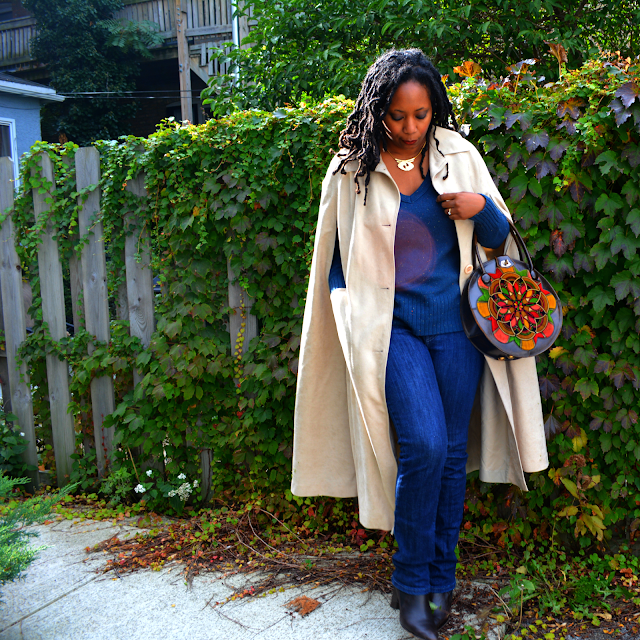 That's me in my vintage microsuede cape. I found it at Goodwill last week along with the reversible clutch. It was steep at $7 but I had to have it. 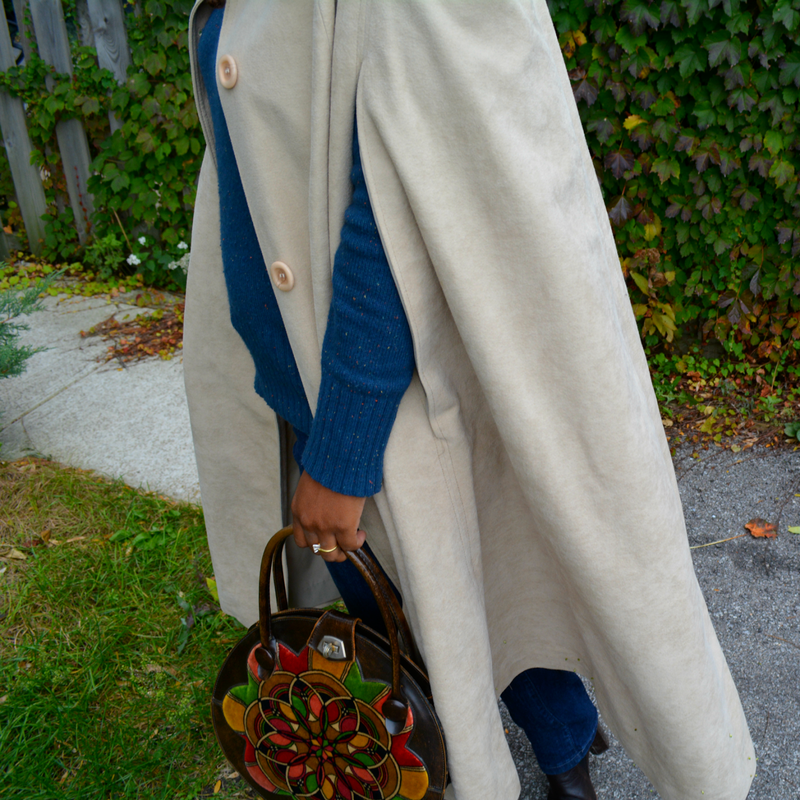 I sewed a cape long ago but it just wasn't functional for my work bag, train commuting lifestyle so I gave it away. Hopefully, I'll get some use out of this one. Knowing how my fashion fickle works, I'll probably tire of it in a week. It's not raining capes in the thrift stores. You're probably better off purchasing from eBay or Etsy. 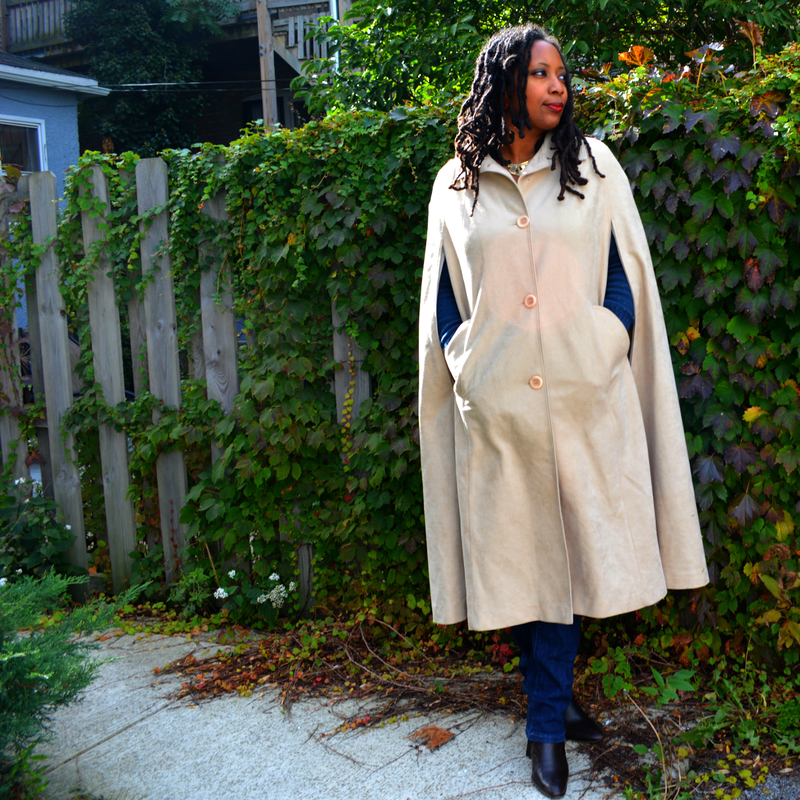 You will find a thrift store cape when you least expect it so it doesn't hurt to peruse the outerwear section every now and then. If you have real winters as we do around these parts, you may want to pick of opera length gloves too for an extra layer of warmth. 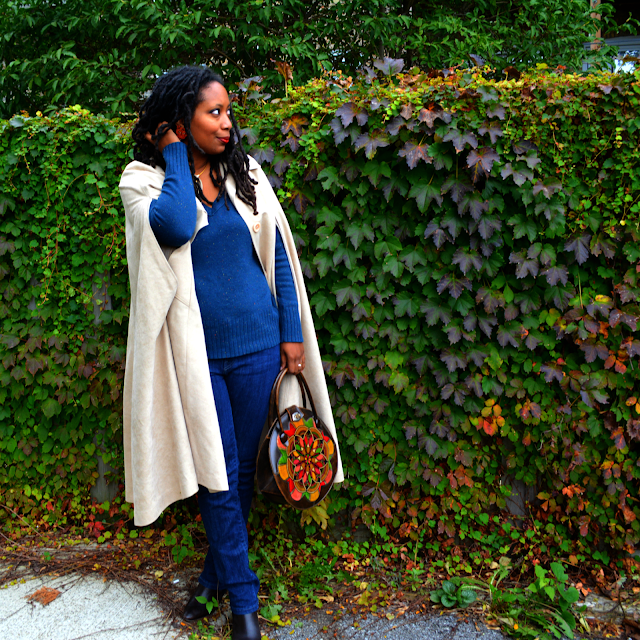 Capes are perfect stay at home mom casual style. 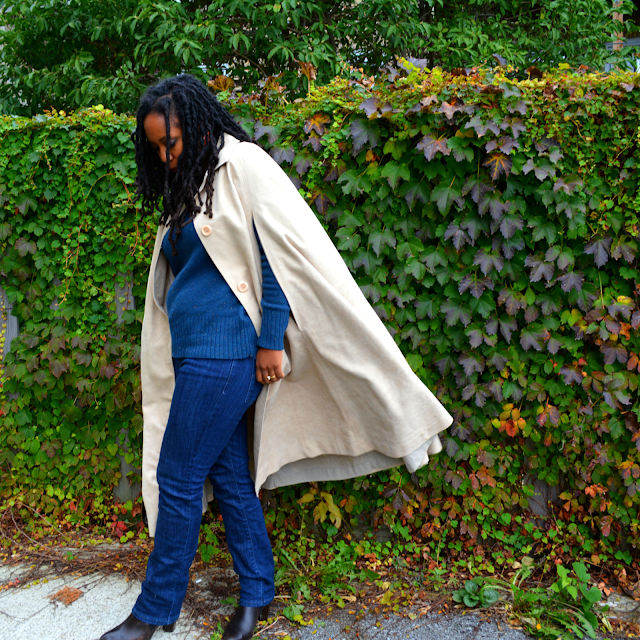 You can throw on a cute shoe, wear your yoga gear, and wrap up in the cape. Who would know? Mind your proportions. If you go cloak length, you run the risk of looking like a sorcerer. Wear your stand out accessories. 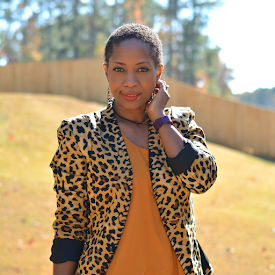 A bold scarf, a purse with great details, or perhaps wolf earrings? Visit my Capes Pinterest board for more styles and inspiration. Did you like the Bottega Veneta clutch from last week? It's now on eBay along with a vintage Dooney & Bourke. Check it out! 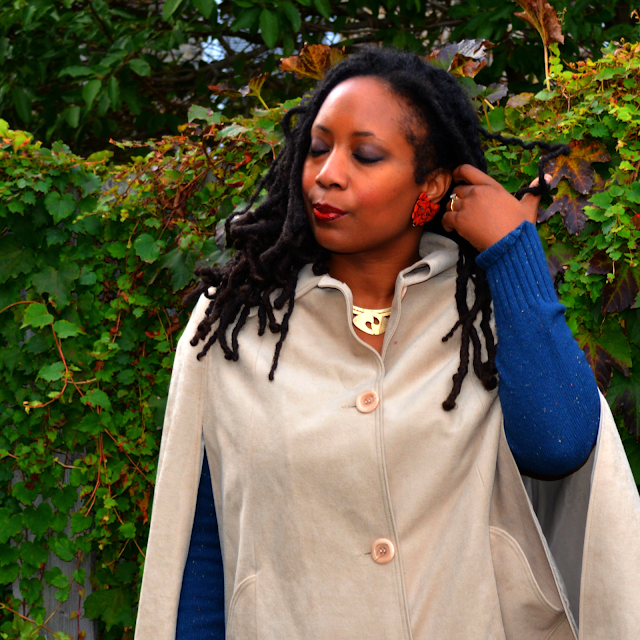 I feel like I'm channeling Little Red Riding hood in the cape and wolf earrings. Low key Halloween costume? You look awesome. Till you move your arms it looks like a textured trench! I have never seen a cape at the thrift store but I'm gonna keep looking! So sharp. I love it on you! !